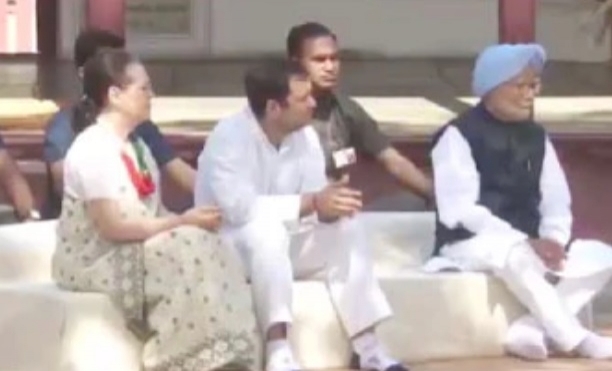 Congress President Rahul Gandhi, General Secretary UP-East Priyanka Gandhi Vadra and Sonia Gandhi arrive at Sabarmati Ashram to attend prayer meet on the anniversary of 'Dandi March'. Congress party will attend a prayer meet at the ashram & then hold Congress Working Committee (CWC) meeting at Sardar Patel Smarak. Congress leaders will begin the day with a prayer meet at the Gandhi Ashram in Sabarmati and after paying tribute to soldiers at a memorial, they will proceed to attend the CWC meeting at the Sardar Patel National Memorial.